It's official. ISIS has wasted no time in declaring that the Islamic Caliphate is established in the Middle East. After quickly conquering territories in Iraq and Syria, ISIS now proclaims their intentions of pushing into Europe. As if that news is not chilling enough, they have demanded allegiance from Muslims around the world. The head of ISIS, Abu Bakr al-Bagdadi, now calls himself Caliph Ibrahim, using the name given to the son of the Prophet Muhammad in order to strengthen the claim that he is now the leader of the Muslims and a direct successor to the prophet himself. This development precludes that Muslims everywhere, not just those in areas under the organization's control, swear loyalty to him. For added emphasis, he was clever in making his announcement on the first day of the Muslim holy month of Ramadan. The group has also renamed itself The Islamic State, and a spokesman released this statement: "'The legality of all emirates, groups, states and organizations becomes null by the expansion of the caliph's authority and the arrival of its troops to their areas. Listen to your caliph and obey him. Support your state, which grows every day." Make no mistake. The Islamic State is real and is not shy about announcing its five-year plan. The Daily Mail reports that the plans include expansion far beyond Muslim-majority countries. 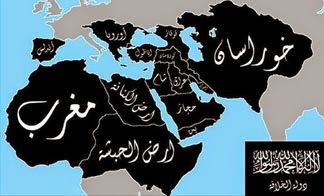 A map shared by their supporters shows that plans are in existence to expand the caliphate throughout the Middle East, North Africa, and large parts of western Asia, including an expansion into parts of Europe. The map shows that Spain, which was ruled by Muslims for 700 years until 1492, is marked out as a territory the caliphate plans to have under its control by 2020. They also plan to take control of the Balkan states -- including Greece, Romania and Bulgaria - extending their territories in eastern Europe as far as Austria, which appears to be based on the pre-First World War borders of the Austro-Hungarian Empire. ISIS has long argued for the return of the geographical boundaries before WWI, and has insisted that the carving up of the Ottoman Empire by Allied forces after the conflict - commonly known as the Sykes-Picot Agreement - was a deliberate attempt to divide Muslims and restrict the likelihood of another caliphate being established. It is a fact that Muslim extremists have long dreamed of recreating the Islamic state, or caliphate, that ruled over the Middle East, North Africa and beyond, in various forms, over the course of Islam's 1,400-year history. And now they see their chance to accomplish that goal! If you need more evidence that these developments should be taken seriously, take note: this marks the first time since the fall of the Ottoman Empire in 1923 that a Caliph--which means a political successor to the Prophet Mohammad--has been named. The Islamic State has "marked its borders", is asserting itself as "a legitimate state", and is announcing that it wishes to usher in "a new era of international jihad." And we should take them at their word. What everyone in the world needs to realize is that The Islamic State has managed to do in Syria and Iraq what Al Qaeda never has - carve out a large swath of territory in the heart of the Arab world and control it. This could mean that al-Queda will be dethroned from their jihadist leadership position, and the younger generation of the jihadist community will become more supportive of [ISIS] because of their slick propaganda and their track record of achieving rapid results through brutality. If you have been paying attention, then you know that the new Caliph's militant forces are not referred to as terrorist "cells", but as a formidable "army" by noted national security experts. These same experts warn that they won't stop at the boundaries of Europe. This is a very real threat to our homeland and our way of life. Not only do we have to be concerned about American-born jihadists, but Middle East oil could soon be under the control of the Caliphate, or at the very least disrupted. We face formidable perils on both fronts. My purpose in divulging this information is not to be controversial nor to create hysteria. But if there was ever a need for a Biblical worldview, now is the time. Bible prophecy indicates that in the End Times, as we get closer to the Second Coming of Jesus Christ, God will allow the Medes (who are the modern-day Kurds) to gain power, even as the Lord allows the Arabs to gain power and rebuild the kingdom of Babylon in the heart of Iraq. The fulfillment of that prophecy is on the horizon! Furthermore, the Bible tells us in the Book of Revelation that Babylon will be the epicenter of the world's evil in the last days. This vision is coming into view! It is time for all men and women to know their history, the Bible, and how you can secure your eternal future. Please don't waste another minute! Yes! You are absolutely correct. The goal of the Caliphate is global dominance of Islam. I tell my children to constantly study history. Only by looking backwards can you see forward. I use the analogy of being lost in the woods. Instinct tells us to retrace our footsteps to find where we went off course. It is only by design that our world has evolved to its present place. God has allowed it because we have wondered off course from him. Satan is leading us down the wrong path and few care enough to even look up, blindly following. God says they have ears that don't hear and eyes that don't see. We must keep being the watchman, sounding the trumpet in hopes that God will open their eyes and ears. Keep sounding the trumpet, I don't like this analogy but, as I have been told, the squeaky wheel gets the oil. This seems to be a popular attitude towards us mainstream society. Seen as doom and gloom instead of the good news of the Gospel. I have always been a lover of history and it saddens me that so many do not see the lessons that can be learned, or acknowledge what history is showing us. I often feel like I am speaking into a void, but it is incumbent on all of us who see clearly to guide our fellow citizens through the fog until the scales are removed from their eyes. And you're correct, Satan is right there, whispering in their ear that there's no need to look up. We must shout in the other ear! Hi Belle - I'm way behind and swamped, but just wanted to say that you're spot on. They say what they mean, and they mean what they say: convert, submit, or die. Those are the choices left by Islam at its salafi roots.